Fans of classic American muscle cars can breathe a sigh of relief…for now – the new Cash for Clunkers legislation that came out of Congress excludes the old rides we all know and love….sort of. Don't worry. I don't see any GTO's in there...at least not any old ones. 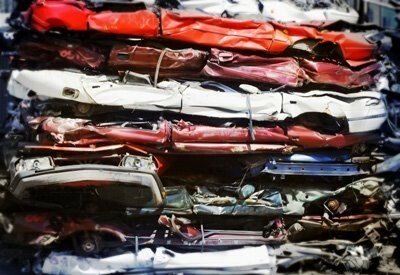 What is ‘Cash for Clunkers’ you ask? In a nutshell, Cash for Clunkers is a federal program designed to entice you-the-consumer to trade in your old fuel-inefficient less-green vehicle for a new one that gets better mileage and is a bit greener. It was originally intended to give consumers an incentive to help the fledgling auto industry get some sales moving and be more environmentally friendly all in one fell swoop. It is available to people to use on a completely voluntary basis and would grant a $3500 (possibly up to $4500) Government voucher towards the purchase of a new car if – and only if – the new car you were purchasing was to replace your old car that had an EPA rating of less than 18mpg, was built after 1984, and that you had owned for at least one year. It would only apply to new cars under $45,000 and the rules for light trucks and SUV’s are different than are the rules for cars. After the transaction is completed, your old car – regardless of its condition – will be destroyed. None of its parts (engine, transmission, rear view mirror, etc.) will be made available to the salvage industry for resale. The bill just passed through Congress and is on it’s way to President Obama’s desk to be signed and passed into law. It’s a $4-billion dollar program carved out of the $787-billion stimulus bill and is expected to start sometime in July, but as of now only $1 billion of it is available – which is predicted to run out just a few months after it gets started. It’s also not the first attempt at getting legislation like this through – it’s been tried before (and other countries have enacted similar measures). Confused already? Don’t worry – it’s a government operation. It’s supposed to be confusing. See these recent articles from the Wall Street Journal and CNN for more details. Let’s dig in to these topics a bit. Since the bill is aimed specifically at 1984 model year cars and newer, anything older than that is not eligible. The majority of the vehicles used today for daily transportation fall into this age range, so that’s the target. Do we as muscle car people care about “new” cars? Well, not too much…..at least not yet, we don’t. Most of us like the older cars, but let’s remember – the special collector muscle cars we like now were one day….just cars. They were cheap. They were plentiful. And now….they’re not so cheap, because they’re not so plentiful! “New” cars may potentially go through the same fate, though this time with a little shove from the government. IROC Camaro’s, 5.0 Mustangs, Buick GNX’s, Impala SS’s – those are all “new” cars that would qualify to be traded in and destroyed under this program. There are still plenty of those cars on the road, being driven regularly. It’s hopeful that people that own those cars are already good “car people” and would not voluntarily lead them to their death, but you never know. Admittedly, those cars do make up just a small portion of the 1984 and newer vehicles on the road. One thing is for certain though – as a result of this legislation, fewer future classic muscle cars will exist. This is the one that will get me in trouble, but I guess it won’t be the first time. Of the two topics I presented as potential casualties of the Cash for Clunkers program, this is the one I am more concerned of. My first venture into small business was (believe it or not) as a financial counselor. To this day I am still a Dave Ramsey Certified Financial Counselor in good standing. I operated my own practice for roughly a year and a half before I sold it to start The MuscleCar Place. During that time I had a lot of interaction with single people and families living under the $40,000 annual income mark. They’re the kind of people that drive older cars and are experienced in keeping older vehicles running using salvage yard parts. They’re also the kind of people that need more debt like a fish needs a bicycle – it’s bad news, and if pressed in a bad spot they’ll undoubtedly sign on to it as the solution to an immediate problem (like when a car blows transmission). What makes matters worse is that they’ll have to finance a new car….which will drop roughly 70% in value in the first 4-5 years of ownership. They won’t get the prime “0%” financing either – it’ll be higher. Much higher. I’ve seen this process work out in other areas – not just cars – and it keeps the poor and the lower middle class in a perpetual cycle of debt. It completely traps them unless they simply choose to take a stand and refuse to participate (and a lot of them are now, by the way). Overall, I’m not in favor of a government program – that we are all paying for – that effectively hurts people by doing something that looks good on the surface, but is actually destructive underneath. (Perhaps the recent mortgage debacle might be a good example of people buying expensive things that were supposed to be a blessing….and ended up being a curse.) It reeks of political wrangling and lobbying, and does not truly seem to have the “little guy” at heart. Subsidizing the potential for people to go in to debt does not seem like a blessing to me. New cars are (for the most part) a really bad investment. I’m not saying that I don’t want the car industry to succeed because I sincerely do want it to succeed, but not everyone really needs a new car. Used cars are a terrific value, don’t depreciate as quickly as new cars, and can last years of properly cared for (they’re also significantly more green than they’re given credit for, but that’s a topic for a different day). I’m also not in favor of legislation that could force people maintaining older cars to have to purchase new replacement parts instead of buying used ones from the salvage yard either – it seems very un-American to me. Quite a mouthful, huh? Probably more food for thought than you thought you’d get on a muscle car website, I know. Let me know what you think. E-mail me at: askrob@themusclecarplace.com. p.s. Here’s a terrific video of a lady with over half a million miles on her Mercury Comet. We could all take a lesson here!